Written by: Bronwen Collins | October 5, 2018. What should you be wearing this Autumn? Blazers. Stop thinking blazers only belong in the office or as dodgy school uniforms. The blazer is the perfect addition to any man’s wardrobe. It can be dressed up or dressed down to suit any occasion and adds a touch of class that will help you stand out from the crowd. But how to wear a blazer? The short answer is: on your shoulders and through your arms. But we do have a few tips to get you started. We love a good blazer at Mainline Menswear and think you should too. Therefore, we’ve got some tips and tricks for you, so you can pull one off every day of the week. Blazers are such a versatile piece of clothing. Wearing one with jeans and boat shoes provides a dressed down look perfect for weekend drinks, or combining with a shirt gives a smarter look without having to wear a full suit. Pair with chinos and a linen shirt and you’ll look smart and stylish, whilst still being comfortable. The key with wearing a blazer to create a smarter look, is to not mistake it for a suit jacket. Unlike when wearing a suit, your blazer isn’t supposed to be the same colour as your trousers. For once in your life, don’t match your clothes! If you’ve got a lighter pair of trousers on, like cream chinos, light blue jeans or grey work trousers, go for a lighter coloured jacket. When wearing white or cream trousers, you can experiment with colour. A blue blazer with white trousers will create excellent contrast and look smart. For light blue jeans opt for cream or grey, or pastel colours. Pastel colours will also pair well with grey trousers, or you could choose a light brown tweed blazer. Pocket squares will also make your outfit look smarter. If you’re already wearing a tie, choose a pocket square in a complementary colour to both your blazer and your tie; but not the same colour. For wearing your blazer in a more casual situation, you can easily wear it over a t-shirt with jeans and still look smarter than most. In casual situations where a sports jacket or a jumper is acceptable, if you’re the one wearing a blazer instead you’ll stand out from the crowd for all the right reasons. 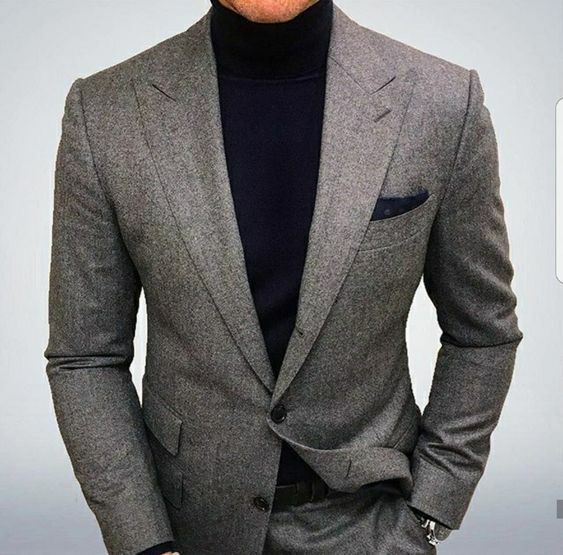 If you’re wearing dark blue or black jeans, you don’t have to worry too much about the colour of your blazer – pretty much everything will match, I’d be horrifically-impressed if you managed to mess this one up. So long as the colour of your blazer doesn’t match your trousers, you can experiment with bold colours, patterned blazers or anything else that takes your fancy. Go wild! Still not sure which kind of blazer to wear? 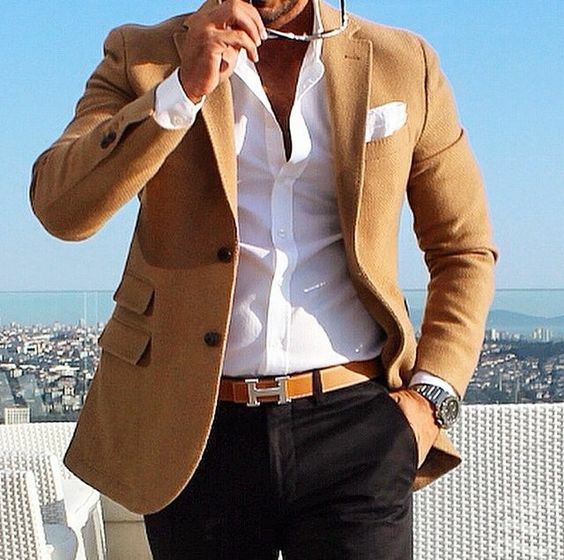 Fitted blazers with the sleeves rolled up can look particularly impressive over a plain white t-shirt. Or you can wear a more relaxed fit with skinny jeans to create levels of structure within your outfit. But What Type of Blazer Should I Buy? There are plenty of different styles of blazers out there, so it really is a matter of personal taste. The most classic looks we’d recommend is the standard double-breasted or two buttoned blazer; if you’re not sure, pick one of these and feel confident with your outfit. To complete your blazer wearing style, accessorise with sunglasses or a statement watch. A watch with a large face will attract the eye and give an extra touch to the smart blazer look.